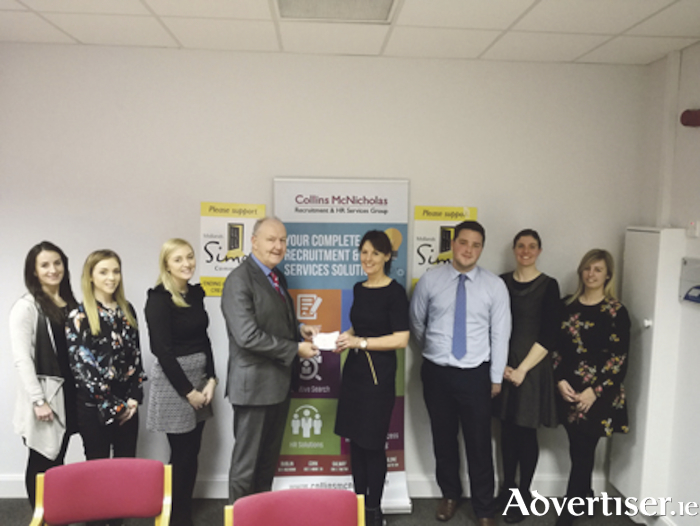 Athlone-based Collins McNicholas this year donated its Christmas gift fund to The Simon Community in an effort to improve the homeless crisis. Money budgeted for client Christmas gifts at the company’s Midlands offices in Athlone was instead donated to the charity, which helps homeless people. Staff also decided to donate their annual internal Kris Kindle gifts to the local Simon community shop. “In light of the homeless issue in the country at the moment, this Christmas Collins McNicholas HR and Recruitment Group decided to donate our Christmas gift fund to The Simon Community nationally in support of their efforts to prevent the problem from worsening,” said Mary Mullin, Collins McNicholas midlands regional manager. Simon Community was one of Collins McNicholas’ Charity Partners in 2017 and the group has raised more than €2,250 to support their efforts. Cheques have recently been handed to local Simon Community charity shops in Athlone, Cork, Galway and Sligo.